Microsoft has released a hotfix for Communicator 2007 R2. If you have problems with the communicator reports that address book can’t be synchronized or that it can’t expand a distribution list (error with distribution group service) you could check several stuffs, including if there is any errors in event log on the Front End server. 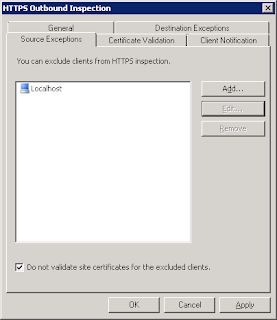 Also check the certificate on the server isn’t expired. If the certificate has been changed recently also check on the IIS web site that the certificate has been changed to the new certificate. 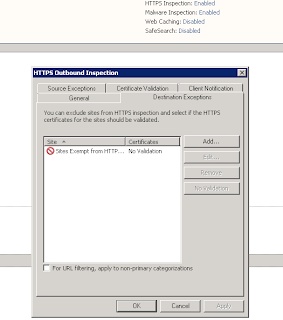 I have seen this error, that the certificate has been changed successful in OCS but it hasn’t been changed in the IIS. I was at a customer today to install a new TMG Enterprise with the Exchange 2010 Edge Transport role installed together with Forefront for Exchange 2010. After the installation TMG didn’t update the Cloudmark antispam engine. I installed Service pack 1 for TMG, and Software Update to SP1, and Exchange 2010 rollup 1, but nothing solved the problem. So I used the logging tool in TMG to see if there were any errors in connecting to Microsoft – and bingo. 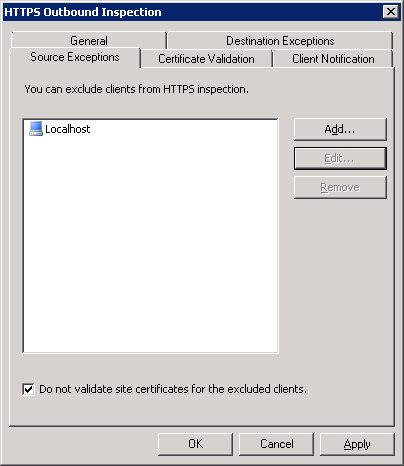 12226 The certification authority that issued the SSL server certificate supplied by a destination server is not trusted by the local computer. 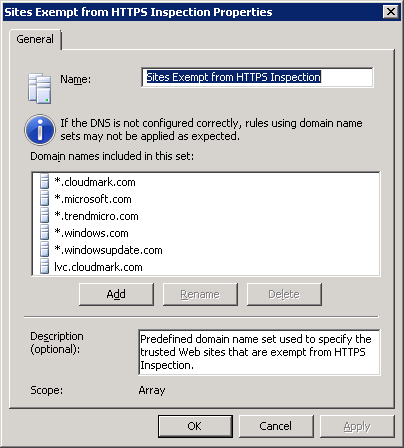 The error tells me that the TMG blocks the request for lvc.cloudmark.com because I’m also is using HTTPS inspection in the TMG. 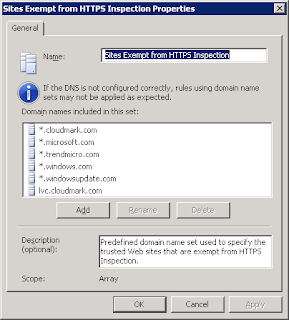 So to solve the problem I created an exception for lvc.cloudmark.com in the HTTPS policy. 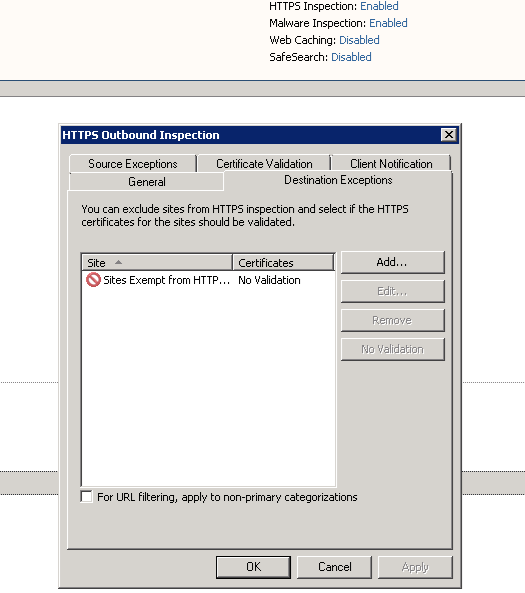 But that didn’t solve the problem – the TMG still blocked the certificate so I also created an exception for the localhost in the HTTPS inspection, and now it worked . The TMG afterwards updated the cloudmark engine successful. Hope it can help others, until Microsoft changes the certificate for the cloudmark update servers. Microsoft has yesterday released the RTM version of Lync to the public – the same day as the big launch for Lync. It’s also avaible to technet customers. So enjoy and have fun with it. You may have wondered why the Unified Messaging packs that has been released to Exchange 2010 SP1, is missing Voice Preview for some language. The automatic speech recognition works fine, but you don’t get voice preview of the voice messages. An example of this problem is the Danish Voice UM language pack. As I have attended TechEd in Berlin this week, Rasmus and I got to ask this question to Michael Wilson which is a Product Manager for Exchange UM in Redmond. He explained what the problem is. Microsoft has developed the Danish Speech to text pack, but when they did live testing at Danish customers prior to the release – the feedback was that it wasn’t good enough. So Microsoft decided not to release this part with the Danish language pack. Michael explained that the way they produce the language pack is by taking a real voice and then transcribes it to text. After a compare of the two parts they makes the necessary changes to the UM pack so that it can do the voice to text. He also told us that they use about 500 hours of voice messages to each language pack – that’s around 15.000 voice messages. However Microsoft is struggling with some EU laws about the voice messages from European countries so they can’t produce the voice messages by them self from the Danish Microsoft Employees. However if private companies in Denmark volunteers to send the voice messages to Microsoft then they will be analyzed and transcribed, so we can get the final peace for that Language pack. The UM role has a feature which allows that voice messages is sent in raw format to Microsoft for analyze. Because it happens on the server and the user has no control over this, you should be very aware of that sensitive information potentially is sent to Microsoft, if the users is not aware of this. However if a voice message is marked as private it is not send to Microsoft. When you enable this feature the users will get a warning on the voicemail, saying that the message will be monitored unless it’s marked privated. So if you will be a volunteer and enable this feature – then remember to inform you users about that this is enabled. Also remember that Microsoft can’t make the last piece of the language pack if they don’t have the 500 hours of voice mails which is required to get a good and working UM pack. Other language packs also have the same issue as the Danish UM pack.